Farro. Doesn’t that sound like a celebrity baby name? Actually, it has a nice ring to it and I kind of like it. Farro Clooney, Farro Jolie-Pitt, Farro Kardashian. Totally works. Farro isn’t a celebrity baby – yet – but an ancient grain with a nutty flavor. The first time I had it was a couple of months ago during my first visit to the amazing and mouth-watering restaurant, Avenue in Medfield, MA (http://www.thetastypage.com/avenue-medfield-part-2/) . The farro came with the wood grilled yellowfin local tuna. It was toasted and really delicious –and just thinking about it is making me want to stop writing and have dinner at Avenue right now. 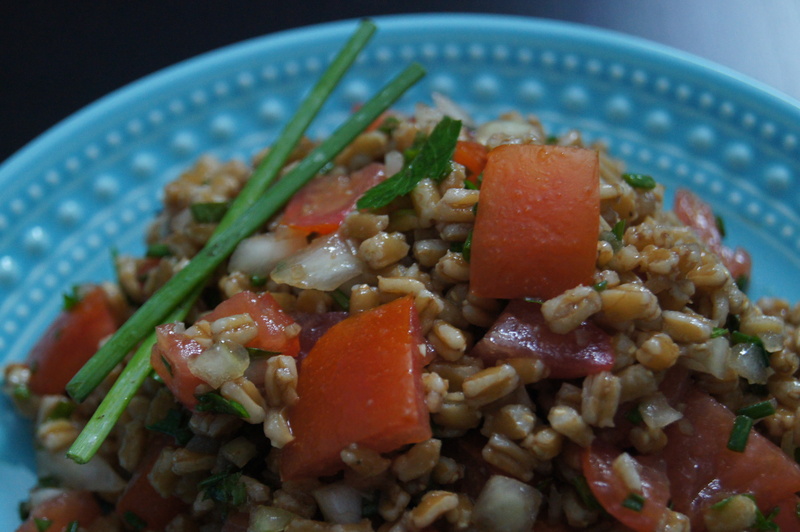 I love trying new things and wanted to try making farro at home. 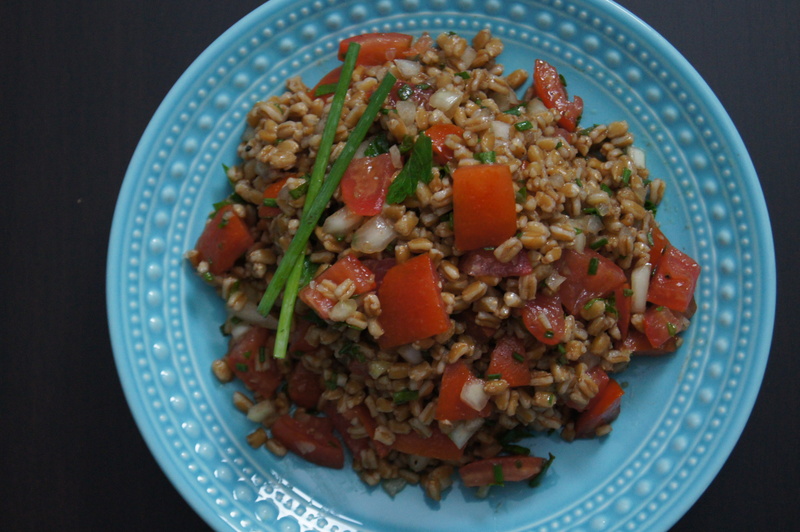 I wanted to make a simple recipe and remembered seeing Giada De Laurentiis make this recipe for Farro Salad with Tomatoes and Herbs. Even better was that I already had most of the ingredients. It really is simple to make and really flavorful. It’s also perfect for these hot summer days when you want a non-lettuce-type of salad for dinner, or are looking for a simple and healthy, but substantial, side dish. Also perfect for bringing to the beach or a picnic if you don’t want anything made with mayonnaise and sitting out for a while. I made the recipe as is, but the next time I make it I think I’ll leave out the onions – or lessen the amount. You may want to also if you plan on bringing this to a party – like for a celebrity baby shower. Combine the water and farro in a medium saucepan. Add 2 teaspoons of salt. Bring to a boil over high heat. Reduce the heat to medium-low, cover, and simmer until the farro is tender, about 30 minutes. Drain well, and rinse with cold water. Then transfer to a large bowl to cool. 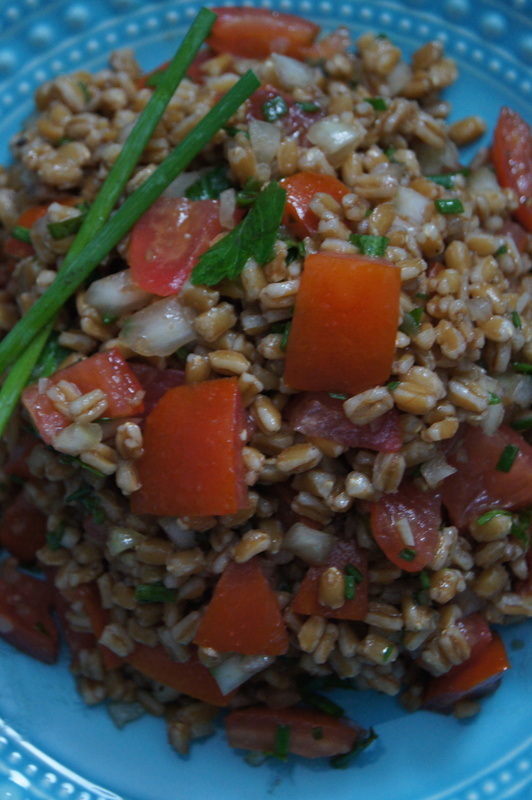 Add the tomatoes, onion (if using), chives, and parsley to the farro, and toss to combine.